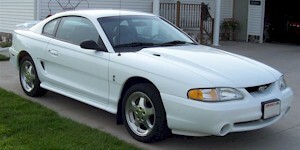 This year you could get the 1994 SVT Cobra in either the the coupe or convertible. Apart from the Mustang was a new front fascia with integrated fog lamps, Cobra snake emblems, a custom rear spoiler with built-in LED stop lamps, better handling, and upgrades to the V8 engine allow for 25 more horsepower. 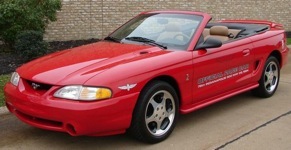 All 1994 Cobra convertibles were Rio Red Indianapolis Pace Car replicas.